Introduce yourself or your organization to tangible creative endeavors. Just ask Beth to present a demonstration or interactive workshop custom-designed for your group in a classroom forum. You can create a potted garden, fresh floral arrangement, wreath, pruning class or alternative natural design – and enjoy yourself while you learn! Beth is also happy to visit you in your own garden to provide private gardening lessons. Dead heading, pruning or general care instruction are all wonderful and impactful ways to learn in your own garden with your own plants. 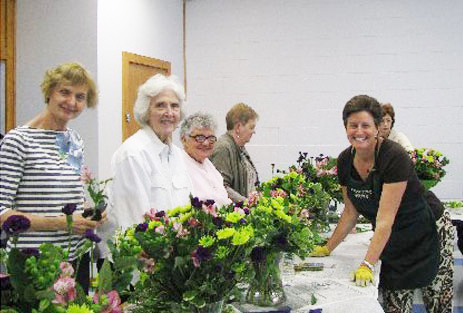 Beth frequently offers hands-on workshops. 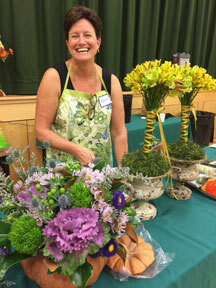 Here's Beth helping her students put finishing touches on their fresh floral arrangements through a community school and local garden club members creating terrariums with Beth's guidance. 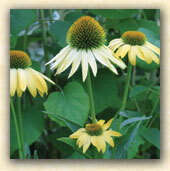 More resources for green thumbs are coming as Beth’s website grows. Check back here to see a gardener’s calendar, find some reading for gardeners – or to ask The Potted Garden for expert advice.